Are You Fed Up of Back Pain? You’re fed up of persistent, ongoing back pain making you feel stiff and old before your time. It’s stopping you doing the things you love. 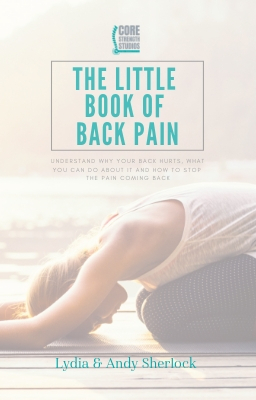 You have tried lots of things to reduce the pain but nothing has really made a difference – you want to get rid of back pain once and for all and start feeling normal again. Your neck and shoulders ache from sitting at a desk all day – perhaps you’re stressed and holding the tension in your shoulders. You have a niggling pain, or tight muscles making you feel stiff, maybe it gets worse with exercise and you just want to get it sorted once and for all. Start your weekend off with a free dose of Core Strength. Every week you will receive a short email with tips for back pain, workout videos, updates and a behind-the-scenes look at what the Core Strength family have been up to! "Sally has done wonders with my back issues. in 2010 I was involved in a car crash that left me with a severe whiplash back and neck injury. Over the past 7 years I have seen a number of physio therapists and pain management specialists, but none of them have had the results that I have experienced through my time at Core Strength Studios. Sally made me feel at ease with the injury that I have and worked with me to improve my core strength, as well as addressing my posture issues created by the prolonged nature of my injury. I now feel taller, stronger and more confident with my movement, and simple things like standing up are significantly less painful then they were 6 months ago. I genuinely thought I was stuck with a life of pain and discomfort, but I have been shown that this is not the case"